As I go around my days, I am usually careful when I sense that I might be moving into unfamiliar places. In Somerville, where I have lived for decades, it would be difficult for me to get lost. Not long after my diagnosis, I started doing a very simple 30-minute walk. I start from my home and walk in a rectangle until I am back on my street. There are other walks, embedded in my long-term memory. One is more challenging. There is a sky bridge, over Route 28, which connects east Somerville with the rest of the city. I hadn’t done it recently. It takes me into Boston. But the path ends at that point. Another route takes me past Tufts University, where Paula studied in the graduate English program. I don’t have to think about where I am. It’s a good 70-minute walk, overall, comparable to the route of The Walk to End Alzheimer’s fundraiser. Foolishly, last September, I did the Walk, despite having a deformed sole on my right shoe. It was months before I could walk normally without pain. Another route of mine follows Massachusetts Avenue, which is my umbilical cord. Sometimes I need to relieve myself. And let’s just say that my prostate gland is not what it used to be. In 2o16, at the end of a vacation in Puget Sound, my cousin’s husband had cooked up a vat of steel-cut oats. I love steel-cut oats. They are very nourishing, and I aim to cook them once a week. But I have to be careful. Like my dad, I struggle with my prostate gland. I know from experience that it can be serious. But that morning, I didn’t take into account the Seattle-area traffic. If I was on a bus, the bus would have had a toilet. But I was riding in a van. One woman on the van offered me an empty plastic bottle to collect my urine. There probably would have been a toilet along the route. But the van lacked that service. We were on Interstate 5, heading toward the airport. Remember those O.J. Simpson commercials running through airports? That’s what I was doing in that early-morning dash to find the first restroom. My goal: don’t wet myself. Goal fulfilled. What about cooking? Over the last week I was alone in our house for a few days, while Paula and our daughter were away. I had dinner with friends every evening, and the first few days, I made canned sockeye salmon sandwiches for lunch. Canned salmon can be fairly costly. The dressing I make is from scratch: olive oil and a smaller volume of balsamic vinegar. And there was an incident, but nothing came out of it. I was eating my five-minute oatmeal at the time. I received a landline phone call. It turned out to be from Paula. In any case, this incident was barely worth reporting. The electric burner was cherry-hot, but that was no great concern. I removed the pan from the burner and shut it off. What about going though security at airports or government buildings? I still yearn for my tan leather jacket, which I lost in 2o15, not long before my diagnosis, and I suggest my jacket is now the property of some airport employee. And in downtown Boston, a couple of years ago, I encountered a guard who seemed to want absolute proof that I had dementia. Who can say? Unless the person is acting in a strange manner. Only in the late nursing-stage do people with Alzheimer’s display typical symptoms: vacant stares, dizziness. And there are two activities that can be enjoyed to the terminal stage: Art and music. This was not the first time that Paula and I had traveled to Washington to advocate in the nation’s capital on behalf on Alzheimer’s and other forms of dementia. But this time more was as stake. In 2016, most people assumed that Hilary Clinton would be our next president. More important, in terms of health care, Clinton would have continued “Obamacare,” or something very similar. Instead, we got a president who has seemed at times to barely know his own mind. For Paula and me, the stakes couldn’t be higher. And that’s why when Paula spotted Senator Susan Collins, Paula immediately engaged in a discussion about health care. Keep in mind that Collins is an endangered species: A moderate Republican. That wasn’t the case a generation ago. But over the decades, polarization has taken its toll. And the real topic in Washington recently was the number of people who advocated on behalf of Alzhiemer’s disease. Under the banner of purple, Republicans and Democrats, engaged with lobbying. Elizabeth Warren made an appearance, but made no political message. At one point, Warren reached out to us with a handshake and a hug. Here is a huge fact: Hours of unpaid Care and Economic value: more than more than $18.5 billion. Why women? The pat answer is, women have always done the dirty work. And I do mean dirty. When my dad was dying at age 86, from congestive heart failure, it struck me that his death was a rather clean death, compared to what I should expect for my own demise. But dying without my marbles is deeply discouraging. But that’s what Alzheimer’s has dealt. And that is no surprise. I am fortunate to be where I am. Sure, I will probably die a dreary death. But, I have been told that Alzheimer’s is a relative painless way to die. And that is probably true. But certainly, it won’t be a noble death, like dying in the battle of Austerlitz. No, we have to move into farce to fully appreciate this disease. Do you see Woody Allen being shot out of a cannon? How clever! The man who fears everything. That’s what living with Alzheimer’s is like. Absolut farce. As many sports fans know, Pat Summitt was an amazing basketball coach. Scanning Wikipedia falls short to explain how successful Summit really was. Yes, she won a silver medal in the Montreal Olympics, as a player, in 1976, but her destiny was to become one of the greatest basketball coaches of all time. Over the decades, the championships kept piling up. You would have to go back to the era of John Wooden at UCLA when to find an apt comparison. From the early 1970s, to find a coach who was so fabulously successful. Better to recall the good days, when her players—most of them—adored her. Why wouldn’t they. Sure, there must have been rivalries among the players, but that is typical. But here are some examples, from Coach Sumitt. Candace Parker was the star of that team, from 2004 to 2008. Parker also was the first women to dunk in an NCAA tournament. Attitude is a choice. What you can think you can do, whether positive or negative, confident, or scared, will most likely happen. In a more aggressive stance, Summitt would say, Here’s how I’m going to beat you. That it. And finally, It’s harder to stay to on the top than it is to make the climb. Continue to seek new goals. Also in the spring edition is a feature about myths about Alzheimer’s. Progress continues, but there are still pockets where some people are in denial. Accordingly, ALZ has published a “myth or fact” feature. The most misleading of the “facts” is that Alzheimer’s is just another part of aging. Even doctors, in the early years of the 21st Century, most doctors thought that senility was a normal process of aging. And even more hoary was the claim that one could not die from Alzheimer’s. The next “myth” is close to my heart. “Only old people get Alzheimer’s.” Well, I have been writing a book about early-onset Alzheimer’s over the past several years. 1. What’s the person doing or not doing ordinary? 3. Has anyone noticed the change (or changes)? 4. Who should have the conversation? Important! 5. What’s best time and place? The ideal reader of my forthcoming book about early-onset Alzheimer’s disease would have just recently been diagnosed with early-onset Alzheimer’s disease or some similar form of dementia. Perhaps the individual is in shock, or in denial. The statistics say that that roughly two-thirds of the victims are women. But that can be misleading in the early-onset realm. In my experience, men and women are usually rather balanced. Many of us were at our peak salaries, and derived part of our identity from our job or from the idea we were supporting ourselves and our families. After I left my job, I discovered that the Alzheimer’s Association organized many stimulating activities. The rationale is that Alzheimer’s is typically a slow-moving disease, and in some cases, people can hang on for as long as twenty years. Of course, this is a progressive disease, but research has shown that people can appreciate art and music even in the terminal stage. Sometimes I describe the Alzheimer’s Association as a social club, on account of all of the outings and plays, with no cost to us. The first play Paula and I attended was a musical, based on a sliver of War and Peace. Tolstoy might be rolling in his grave, but it was great entertainment. More recently, we attended an excellent production of Othello at the A.R.T. in Cambridge. As a college-writing instructor at Northeastern University in the nineties, I became well-acquainted with Shakespeare’s greatest tragedies including Othello, the Moor. At the time, the O.J. Simpson trial was fresh in our minds, and it was stimulating to note the comparisons. The A.R.T. production was fresh. Rather than grounding the play in the Elizabethan world, the production was set somewhat in the present time. One scene was set in a gym where Othello and Iago worked out, with numerous screens in the background showing global hotspots, in the CNN style. But this is all prologue. 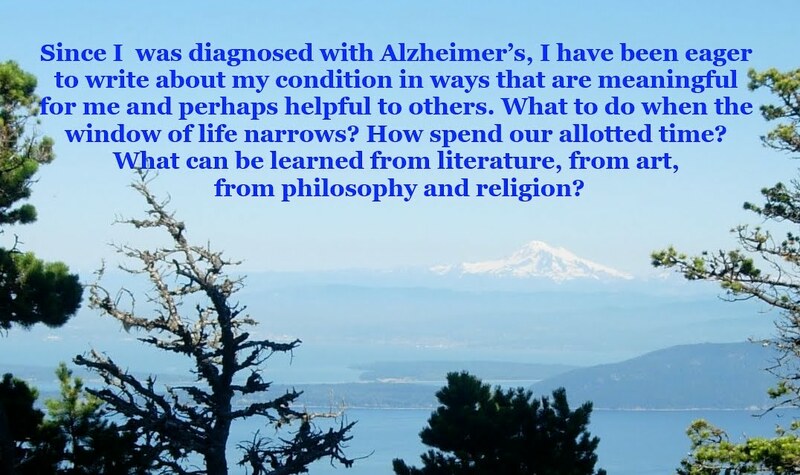 My objective is to explain how I can help people who are very new to the concept of dementia. First, I would say, “How long have you been feeling this way? Are you scared? Can you remember when you first noticed that you didn’t feel like yourself?” These are challenging questions. You might want to get a notepad and a comfortable chair, and write about your reactions. Does Alzheimer’s run in your family? Even if it does, don’t panic. My understanding is that having a parent with Alzheimer’s is just one risk factor. You might have a higher risk than the general population. I have seen figures suggesting that even if you do have the APOE4 gene, your risk goes up by only roughly 40 percent. And it took some time to allay my brother’s fears that he was at risk. Fortunately, I was able to draw on Alzheimer’s Association figures and facts, and that was the end of the conversation. But there are other aspects in which you can drive your destiny, at least partially. Here are a couple of examples. The first is close to my heart, literally; it is regular exercise. I stopped jogging sometime in my forties, partly because I sensed that I wasn’t doing my lower joints any favors. But now I swim or walk half an hour to an hour a day. Another way to keep yourself sharp is to stay socially engaged. After you leave your job, there are many ways that people with dementia can remain engaged, from support groups to going to a place of worship to volunteering at a senior center to meeting with friends on a regular basis. Across the country, the Alzheimer’s Association has events to keep people living with the disease busy and engaged. Even if you’re depressed and don’t feel up to going out, you’ll find that being with other people who know about and accept your diagnosis will raise your mood by helping you to stay engaged. Third is pursuing a healthy diet. It’s up to the people living with the disease to make the decisions. If you like olive oil, get in the habit of making your salad dressing. It’s quite simple. The cornerstone of the Mediterranean Diet is olive oil. And I love dipping crusty bread in the oil. If you are in a hurry, you can use the Paul Newman brand, but I tend to find it too acidic. I haven’t measured this yet, but I prefer my own concoction, which is roughly two parts olive oil, and one part balsam vinegar, with a moderate amount of pepper. But this is not all about lifestyles. There are a plethora of choices. The guiding concept is to live in the moment, and avoid self-pity. And look for moments that others miss. After I was diagnosed with Alzheimer’s disease in 2015, I was given Aricept, one of the two main drugs for people still in the early or middle stage. But without anyone asking me, I was prescribed an antidepressant. But the doctor seemed to suggest that anyone with Alzheimer’s would be depressed. In my case, I felt much better after I left my job. In fact, within a week, I felt much than I had for the past two years. For me, leaving my job quickly was a godsend. My vocation as a writer allows me to work at home. And that is one reason why I don’t often get the blues. But the fact sheet is quite dated: 2003. That was the same year that Joanne Koenig Coste published Learning to Speak Alzheimer’s, a book that has had a huge impact in this century. Here are some of the more relevant points. At that time, in 2o percent to 40 percent with Alzheimer’s become depressed. “Identifying depression in Alzheimer’s can be difficult. There is no single test or questionnaire that can lead to a diagnosis.” The fact sheet notes that apathy itself can be a symptom of depression. According to the fact sheet, this is what many of my cohorts and I should expect—a slow, long trek where the victims’ families will bury their dead. According to a group of investigators with much experience in studying dementia, the *National Institute of Mental Health proposed the diagnostic. Here are some of the listings from the fact sheet: “Significantly depressed mood—sad, hopeless, tearful; decreased positive feelings; social isolation; disruption in appetite that is not related to another medical condition; disruption in sleep; agitation or slowed or; disruption that is not related to a medical condition. *This is not the current name of this building. I first came across Dr. Dale Bredesen in November 2016, when he was invited to appear on the Today program. Now, he has published a book of close to 300 pages, in which he claims that he has found the key to not just stop Alzheimer’s, but reverse its damage. For many people in the field, this might sound like science fiction. But, after all, solving Alzheimer’s disease has become the holy grail of the early 21st century. It’s not just the terrible toll inflicted on the victims. Family members are often drafted into being “volunteer caregivers,” which can put pressure on the whole family. The book opens with the fact that even the gods of the biotechnology world rarely make a splash, and when they do, failure is almost foreordained. This was the case in 2018, when Biogen almost overnight raised the hopes of people with dementia to think that Alzheimer’s might be domesticated—the way AIDS became a manageable disease after Magic Johnson showed the world that the HIV virus could be just another manageable disease. But here is a downbeat message that we might be hearing for decades: The human brain is too complex to be “fixed” by mortals. My understanding is that only the most recently diagnosed would benefit, should a breakthrough drug arise, not people already into the middle phase of Alzheimer’s, like me. That was my takeaway. Am I fatalistic? Not really. But I am realistic. The failure of Biogen’s compound set me back, and I started to direct myself to focus on the time I have left—the original purpose of my blog. Bredesen introduces “Kristin,” who at the time was considering suicide. Her mother had died from the disease after 18 years of decline, “And at the end Kristin had suffered alone, for her mother was no longer sentient.” At 65, Kristin started to show the telltale signs of Alzheimer’s herself. Common symptoms arose: “Unable to remember numbers, she had to write down even four digits, not to mention phone numbers.” She began to get lost in what previously was common terrain. According to Kristen, she confided to a family member, “Did you know I had Alzheimer’s disease?” The family member answered, “Of course, it was obvious. I just did not want to say anything to you about it.” Reluctantly, she retired. For Bredesen, the next sentence is crucial: “Alzheimer’s disease does not arise from the brain failing to function as it evolved to” [author’s italics]. And “Kristen was Patient Zero,” according to Bredesen. Since 2016, Bredesen has been illuminating his main point. Chapter 3 is titled, “How Does It Feel to Come Back from Dementia?” Confident? Most important, it doesn’t tell you what Alzheimer’s disease actually is. Chapter 4 provides a primer for the Bredesen program. And this is where I have a qualm. Not a big one. More of an inconvenience. From early on, and even before my diagnosis, I was following the Mediterranean Diet. After I was diagnosed with early-onset Alzheimer’s, I was gladdened to learn that the Mediterranean Diet was for real. After I left my job, I began to dose myself daily. That was well more than three years ago. But the two approaches to diet are almost opposites. Let’s just say that I am playing on someone else’s football field. So what are my options? Be stubborn? I’d be a fool not to give the Bredesen approach a chance. But in the weeks and months ahead, I may be pining for my favorite foods, which include steel-cut oats, soaked overnight, and then cooked another 10 minutes in the morning. Of course, I would follow the Bredesen protocol for a trial, assuming that I can get into some kind of trial. But I will miss my olive oil, and my daily crusty bread as my communion loaf—assuming that Bredesen’s diet doesn’t pan out. I have doubts. Too many brilliant minds have met their match in the sticky amyloid in the human brain.